M6.0 - 26km SW of Ocos, Guatemala 2012-07-29 12:22:15 UTC - On 29. July 2012 12:22:15 PM, an earthquake occurred in Guatemala potentially affecting 2020000 people within 100km. The earthquake had magnitude 6M and depth 35.5km. Located atop three of the large tectonic plates, Mexico is one of the world's most seismologically active regions. The relative motion of these crustal plates causes frequent earthquakes and occasional volcanic eruptions. Most of the Mexican landmass is on the westward moving North American plate. The Pacific Ocean floor south of Mexico is being carried northeastward by the underlying Cocos plate. Because oceanic crust is relatively dense, when the Pacific Ocean floor encounters the lighter continental crust of the Mexican landmass, the ocean floor is subducted beneath the North American plate creating the deep Middle American trench along Mexico's southern coast. Also as a result of this convergence, the westward moving Mexico landmass is slowed and crumpled creating the mountain ranges of southern Mexico and earthquakes near Mexico's southern coast. As the oceanic crust is pulled downward, it melts; the molten material is then forced upward through weaknesses in the overlying continental crust. This process has created a region of volcanoes across south-central Mexico known as the Cordillera Neovolcánica. The area west of the Gulf of California, including Mexico's Baja California Peninsula, is moving northwestward with the Pacific plate at about 95 mm per year. Here, the Pacific and North American plates grind past each other creating strike-slip faulting, the southern extension of California's San Andreas fault. In the past, this relative plate motion pulled Baja California away from the coast forming the Gulf of California and is the cause of earthquakes in the Gulf of California region today. 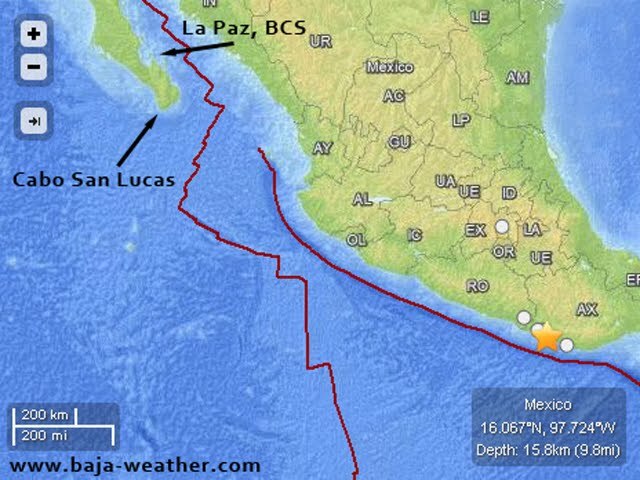 Mexico has a long history of destructive earthquakes and volcanic eruptions. In September 1985, a magnitude 8.1 earthquake killed more than 9,500 people in Mexico City. In southern Mexico, Volcán de Colima and El Chichón erupted in 2005 and 1982, respectively. Paricutín volcano, west of Mexico City, began venting smoke in a cornfield in 1943; a decade later this new volcano had grown to a height of 424 meters. Popocatépetl and Ixtaccíhuatl volcanos ("smoking mountain" and "white lady", respectively), southeast of Mexico City, occasionally vent gas that can be clearly seen from the City, a reminder that volcanic activity is ongoing. In 1994 and 2000 Popocatépetl renewed its activity forcing the evacuation of nearby towns, causing seismologists and government officials to be concerned about the effect a large-scale eruption might have on the heavily populated region. Popocatépetl volcano last erupted in 2010.